For the first time in six years of our activities we held an evening stall with a video projection on November 9 on King Tomislav Square in Zagreb where we showed a documentary from The Captive Animals’ Protection Society-CAPS ‘Sad Eyes and Empty Lives’. Because of the great interest we are now planning on having regular street video projections. We sent a report to the Croatian public about the recent BUAV undercover investigation which has exposed a ‘Guantanamo Bay’ style ‘prison’ for macaque monkeys close to popular Spanish tourist destinations including Barcelona, shipped from Mauritius for the research labs across Europe. We also sent a newest report on the statistics on the number of animals used for experiments in the EU which can be seen at www.prijatelji-zivotinja.hr/index.en.php?id=847 and stressed out that it is necessary for Croatia to legally ban experiments on primates. On November 15, we organized a protest march against the killing of animals for fur in Sarajevo. During the march our activists dragged ‘blood-stained’ fur coats on chains and showed videos of animals on fur farms. Everyone interested in becoming an animal rights activist in Sarajevo can feel free to get in touch with us. In order to inform about the Animal Protection Act regulations according to which pigs may only be slaughtered if previously being stunned to our fellow citizens, on November 24 we organized a whole-day-long info stall in Zagreb with vegan tasting. During the evening hours we had a projection of the video ‘(No) Heart for Lucy?’. The aim of this action was also to point out that there is no such thing as humane slaughter; an ethically conscious society and individuals are those who aspire towards compassion and a non-violent diet. We sent a protest letter to the Malaysian Embassy in Zagreb with the request to Malaysia to maintain the important monkey trade ban which was implemented in 1984. Namely, at a time when there is a growing international concern over the plight of primates in areas such as research, Malaysia is planning on lifting the ban on primates export instead of protecting its indigenous population of monkeys by refusing to allow their export for any use. On November 30, as part of an international campaign, we held a peaceful protest in front of Zagreb’s ESCADA store so as to urge the ESCADA management to completely withdraw real fur from its stores for the animals’, environment’s and their reputation’s sake. The same day, on Zagreb King Tomislav Square we showed a video projection ‘Cruelty by Design’. Don’t Buy Animals – Adopt Them! Together with the Croatian celebrity Maja Vucic we opposed to the buying of animals, especially before the ongoing holidays, and called for homing of abandoned dogs and cats. The situation in Croatian shelters is critical while the illegal and legal trade with animals is blooming. – After addressing politicians regarding the parliamentary elections in Croatia, we also appealed to the voters to ask themselves who would be the political choice of their dog or cat, or any other companion animal that is in their care. Our open letter can be seen at: www.prijatelji-zivotinja.hr/index.en.php?id=853. 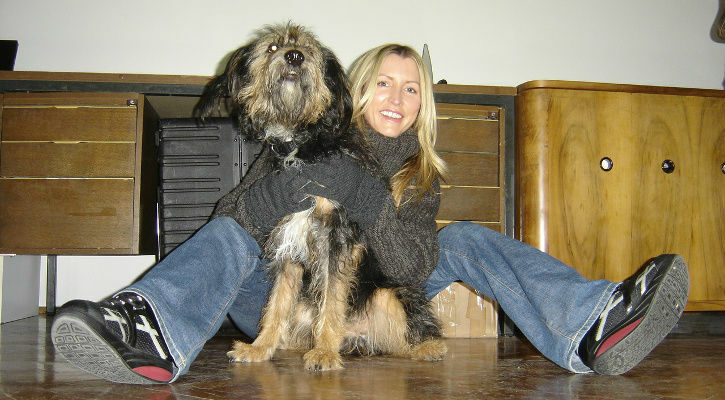 – The famous vegan, Heather Mills, briefly visited our group. During the conversation she praised the legal ban on breeding animals for fur and the ban on seal products trade, and gave her support to the campaign for a ban on import of Chinese dog and cat fur. Only a few days after her leaving, the group Viva! launched together with Heather Mills their big campaign about the impact of the meat industry on global warming. The billboard and more about this campaign can be seen at www.prijatelji-zivotinja.hr/index.en.php?id=856. – We want to protest against the sluggishness and dullness of the Croatian Ministry of Agriculture, Forestry and Water Management regarding our demand for an urgent change of the regulations on the identification of dogs. That is our initiative for legalizing the microchipping of all dogs which was so far supported by the cities of Zagreb, Split, Rijeka, Pula, and Varazdin. – Earlier than ever before we announce the big international protest against fur. This year the protest will be dedicated to the seals and the European ban on seal products trade, which does not yet exist. The protest will take place on March 15, 2008. You can find detailed information here www.prijatelji-zivotinja.hr/index.en.php?id=855. – We sent a demand for the proclamation of the permanent dolphin reserve near Mali Losinj to the Croatian Ministry of Culture, Nature Protection Directorate, which is unique on the whole Mediterranean and important for the protection of dolphins in the Adriatic Sea. – The promotion of the book That Equal Creatures (published in Croatian) took place on December 12 in Varazdin. During the promotion we showed the video ‘Their Future in Your Hands’ in a projection and collected signatures for the ‘Animals Matter to Me’ petition. – After successful concerts in Zagreb, Vinkovci, Vukovar, and Zupanja, 3o/4tet performed on December 16 in Serbian Backa Palanka. This time too it was accompanied with a vegan tasting and the projection of the ‘Earthlings’ video. – Look for the new interesting features on our web site, like IFAW’s baby seals gallery, new books, etc. All our supporters and advocates are the key to our success and efforts to protect animals from cruel and inhumane treatment. Please help us so we could do more by inviting your friends to join and support us in our fight for animals. Thank you for being with us during 2007; we will be happy if you stayed with us in the next year, too.